MONTRÉAL, QUÉBEC--(Marketwired - Dec. 4, 2013) - Management of KHALKOS EXPLORATION INC. (TSX VENTURE:KAS) ("Khalkos" or the "Corporation") is pleased to announce the results of its strategic stripping campaign on the gold property of Villebon (V property). A total of ten chosen samples of rock were selected for assaying, including three from a mineralized quartz vein in sulfur which yield a gold grade up to 2.36 ounces per ton (73.36 g/t) and 2.22 ounces per ton (69.19g/t). Samples of quartz-run around the old trench returned with grades up to 4.1 g/t Au. Fieldworks were performed in the central part of the property, more precisely, in the area of the vein #3. Historically, the stripping values reported were never greater than 16 g/t Au. The stripping of the vein #3 is situated 500 metres from the vein #4 which is currently undergoing diamond drilling and the stripping zone of Céré who yielded a 72 g/t Au (Ref. to the press release of November 19, 2013). Samples came from a vein of quartz mineralized in pyrite, pyrrhotite, chalcopyrite and galena. These results confirm the strong potential of high grade veins in the sector of vein #3 and the Céré's old headframe. Following these results, Khalkos intends to increase the bulk sampling previously planned. The Company will begin the excavation in the upcoming weeks. It plans to ship around 12 tons of selected materials that will be later sent to the small scale facility of ExploLab at Val-d'Or. This will allow Khalkos Exploration to pour its first ounces of gold and to measure more precisely the gold grade of the vein. Following an insurance program and an analytical control of quality, the ten selected samples of the V Property were assayed at the laboratories of Bourlamaque Ltd in Val-d'Or, Quebec. Using the fire assay, samples with a gold grade higher than 10g/t were re-assayed by the gravimetric method. The samples were prepared following the standard procedures of Bourlamaque. The V Property in the Villebon Township is located 47 km south of the city of Val d'Or in Abitibi, Quebec and 12 km south of the former Chimo mine which produced 363 000 oz of gold between 1966 and 1996. The first mineralized showings were discovered in the 1930s, and underwent stripping, rock sampling, and drilling in the 1940s and 1980s, with no additional drilling since then. It should be noted that a drilling campaign of NQ calibre is currently underway in the sector of the vein #4 situated more than 500 metres of the vein #3 and 1 km from the Céré's headframe. 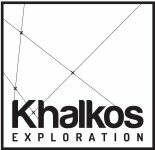 Khalkos Exploration Inc. intends to proceed with, in winter 2014, a drilling campaign aiming to demonstrate the continuity of the high grade significant gold system that has been recognized for over 1 km. During the 1940s, the V Property underwent a small-scale artisanal mining operation, producing around 160 oz of gold, which was then sent to the Royal Canadian Mint. (Licence no. 112, file 101.39, Service des Mines, Province of Quebec, Gustave Céré). Robert Gagnon, President and CEO, declares: "We are very encouraged by these results that confirm the economical potential of these high grade veins in the V property. The updated gold system is traceable on more than 1 km and is still open in depth. The future fieldwork will allow Khalkos to validate the potential of the Villebon property in order to bring it in the near future to the stage of economic resource".